We live in a new business era built on technology. We live in a time when economic and political philosophies are causing it to be harder to make income and secure wealth. But we also have the greatest opportunity for passive or supplemental income we’ve ever dreamed about: the Internet. “Online business” is the frontier of home-based business, side businesses, and the self-employed. The ENTIRE WORLD is literally your buying audience, accessible from a keyboard sitting at your kitchen table. It’s mind boggling. I started on the Internet primarily as a writer before it was called “internet.” A couple of years ago, I turned my attention to “online business” and have learned how to generate income from a wide variety of revenue streams. My “side” income from passive 24/7 online business projects now exceeds my income as an employee. I’m just an average Joe. I did it, so can you, and I’m going to teach you how. It’s too much to squeeze into one small book so you need to make sure you are signed up at www.linkyblog.com where you’ll find tons of great information about online business, passive income, blogging, and personal finance in general. Because I genuinely want people to succeed… because I genuinely believe “online business” is doable for everyone… because I believe that the Internet is big enough to let us all play together… and because I believe we are living in a time politically and culturally that demands we bring in income from multiple sources and not just depend on a job, I have dedicated this year to teaching anyone who wants to learn, all my secrets, lessons learned, and ideas about how to make good money with an online business. 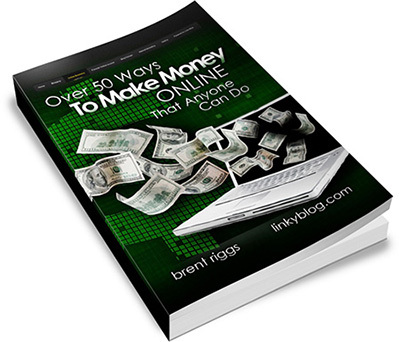 I am going to start by going over a reference list of 50+ ways you can make money online; then I will follow with a more detailed look at ten of the more popular options. 1. Adtegrity – You've got the site, the content, and the traffic, now it’s time to turn those eyeballs into revenue. You've come to the right place. At Adtegrity, we're always interested in adding high-quality family-friendly websites to our growing collection of publishers. Our philosophy is simple: serve an ad to every single visitor while maintaining top-notch performance for Advertisers. 2. Amazon’s Affiliate program – Choose from over a million products to advertise to your customers. Whether you are a large network, content site, or blogger, we have simple linking tools to meet your advertising needs and help you monetize your web site. Earn advertising fees from Qualifying Purchases, not just the products you advertised. Plus, our competitive conversion rates help you maximize your earnings. Get up and running today. Just one approval to join—no third-party advertiser approvals. 3. Aweber Communications– Create profitable customer relationships for your business! AWeber's email marketing tools like professional email signup forms and autoresponder services make it easy for you to build your email list and stay in touch with prospects. When using the Internet, people tend to rely heavily on recommendations. Why do you think this is so? Well, first of all, most people hesitate to try out a product from the Internet relying solely on the product’s own marketing campaign. It’s like putting your trust in something that has no guarantee. The online market can be a dangerous place after all. There are as many scammers as there are legitimate businesses. No one wants to be put in a place where they end up buying something that does not live up to its advertising hype. What business owners have found out is that if someone actually referred their product to someone else, the owners have a higher chance of making a sale. It’s the same thing as with the physical world. If your friend or someone you trust came up to you and told you that this restaurant she tried the other night had killer tacos, you would most likely believe her. Because it is coming from someone whose opinion you value, you are likely to take her up on her recommendation. The same goes with affiliate-product sales. You mention a product on your website and offer a link that goes to the product owner’s website, and you get something out of that recommendation if a sale goes through. You would be surprised at how the numbers add up, especially if you are recommending a really good product. There are about a million options for affiliate-product sales on the Internet right now. In order to find the affiliate program that is best for you, it is necessary to do your research and find affiliate-program features that will integrate well into your blog. You may want to check out Amazon’s affiliate program. As you know, Amazon is a giant when it comes to selling products online. They are well known and offer millions of products that you can recommend on your blog. Amazon also makes it easy on the blogger by offering linking tools so that you will not need a programmer just to participate in their affiliate program. Another good affiliate program is FlexOffers.com. They have a wide variety of available affiliate products from automotive to clothing accessories, media to insurance, and many more. It is highly likely you will find a product that you would like to recommend. When considering product affiliation, you should be careful about the sort of products that you recommend. While it can be very tempting to provide links to products that are highly sellable, ask yourself first: is this something that you would really recommend to other people? Integrity comes first even in the virtual world. Maybe your blog will become famous for recommending the right kind of brands, which will pull up your credibility and authority. Wouldn’t you prefer this to a blog that is known for linking up to sites which sell bad products? Make sure you put a lot of thought into your recommendations. Your blog-reading public counts on you to only make honest recommendations.